I first discovered the Detrended Price Oscillator in Steven Achelis' Technical Analysis A-Z. Since then it has become a firm favorite. Used to isolate short-term cycles, Detrended Price Oscillator compares closing price to a prior moving average, eliminating cycles longer than the moving average. 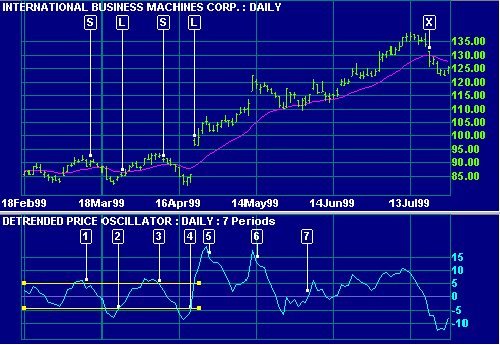 IBM Corp. with 7 day Detrended Price Oscillator, and 21 day exponential moving average (MA). The Detrended Price Oscillator is used for analyzing the short cycle and the moving average is used to identify and exit trends (with closing price as a filter). Price is ranging - indicated by the fluctuation around the MA. Go short [S] when Detrended Price Oscillator turns back below the overbought level. Go long [L] when the Detrended Price Oscillator turns back above the oversold level. Price breaks out of the trading range - confirmed by the larger Detrended Price Oscillator swing. Switch to trend signals. Note how the long trend rises steeply but the Detrended Price Oscillator isolates the short cycle, forming a lower peak. More aggressive traders (see alternative rules) will exit at this point. Detrended Price Oscillator crosses back to above the zero line, indicating a useful trend entry point. The up-trend remains intact - there are no closes below the MA. More aggressive traders (alternative rules) would re-enter their position at this point: Detrended Price Oscillator has formed a higher trough. Exit when price closes below the MA at [X]. The default indicator window is set at 20 days. To alter the default settings - Edit Indicator Settings.